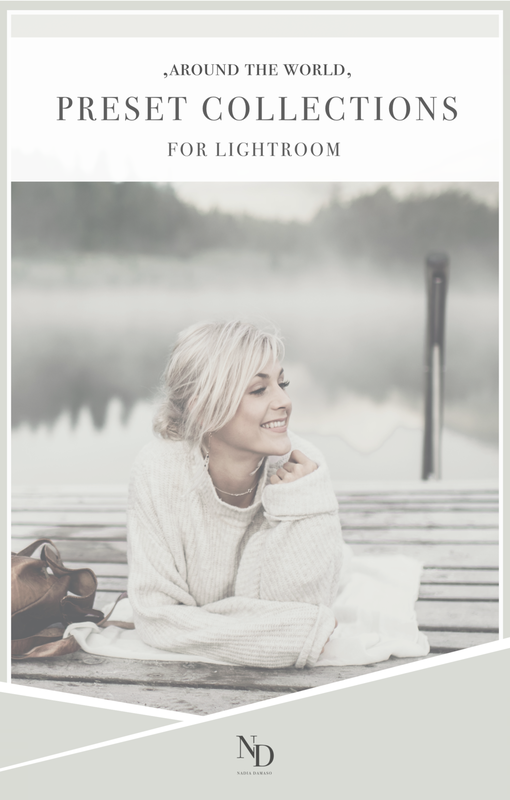 Finally, my very first Lightroom Preset-Collection is here! I have such a big passion for the art of photography, creating & editing, giving my photos a unique look and giving them „my signature.“ My collections of presets are exclusively put together for you and give you access to the presets I used to edit the photos in my new travel-cookbook „Eat Better Not Less- Around the World.“ If you own the German hard-copy or the English ebook, you probably noticed the look and feel of the pictures and how they all have this similar, pastel-like, creamy, smooth, soft & faded touch. And because my new book isn't simply a cookbook but a real travel- & experience cookbook -filled with photos of all kinds and not just food photos- I created the following collections: A FOOD COLLECTION, a PEOPLE COLLECTION, and a TRAVEL COLLECTION. Each collection comes with seven individual presets (which are filters to add to your photos basically). Depending on what kind of photos you want to use my presets for, you can either get the collections individually or get the FULL 'Around the World' collection with access to all three collections. You also have the option to choose from whether you want to get them for the Lightroom CC desktop version OR the Lightroom mobile app (which is free of charge). No matter what you eventually decide to get, each purchase comes with an exclusive and over 80-pages long PHOTOGRAPHY GUIDE (find out more about it below). The guide has an INSTALLATION GUIDE for the presets included and you'll also find a before & afterphoto as well as a more detailed description for each preset, that will show you how much magic you can easily add to your photos with a few clicks only. If you don't have a lot or no experience with Lightroom & using presets yet, simply scroll down and dowload the Installation guide on my Q & A page. To give you an insight of how the before & afters of my Lightroom presets look and to learn more the different collections, simply click on the overview button below. I get asked so much about how, when & where I take my photos, what camera & lenses I use and so on. To make it as easy for you as possible to fully dive into my world of photography -no matter if you're completely new to photography or simply want to learn more about it- this guide will explain everything you need to know about my style of photography from A-Z. The guide will not only give you a good understanding of what Lightroom presets precisely are (if you don’t know yet), how to use them, how to install them and so on; you will find a before & after photo for each individual preset that is described in more detail. To get a good overview of what's included in the guide and where to get it, click on the button below. (P.s: The full photography & preset installation guide as well as a discount code for my new travel-cookbook are included for free in each purchase of presets). And if some of your questions still are unanswered, please don't hesitate to contact me and send me an e-mail to presets@nadiadamaso.com, I'm always happy to help! ARE YOU READY TO CREATE SOME MAGIC TOGETHER? With all being said, I hope you're excited to dive into the visual world of "Eat Better Not Less- Around the World!" I wish you lots and lots of joy & fun, and don't forget to follow me on @nadiadamasopresets and/ or to tag #nadiadamasopresets whenever you use my presets and post a photo of it!